From almost zero - to nearly 100 pairs! Once abundant on Bermuda, Bermuda Petrels - also known as Cahows - were drastically reduced by human harvesting and introduced predators. From the early 1960s and for the next 40 years, David Wingate dedicated his life to helping the Cahow regain a solid foothold. He ran the conservation program for the birds. Today, there are at least 99 breeding pairs of Cahows, and new breeding sites have been established. Read more of David Wingate's story and learn more about Cahows and the project to conserve them. Just how big a difference can one person make in saving a species in peril? In 1951, David Wingate was a 16-year-old schoolboy when he and two scientists made an astounding discovery. 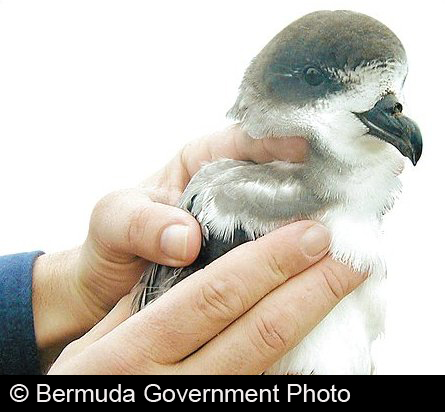 On rocky islets off Bermuda, they found a few nesting pairs of a seabird known as the Bermuda Petrel or Cahow (pronounced ca-HOW), believed to be extinct for 300 years! Once abundant on Bermuda, the birds were drastically reduced by human harvesting and introduced predators. “They remained undetected, owing to their vast ocean range far from Bermuda, their nocturnal activity on the breeding grounds,”1 and the fact that they nested only in deep crevices and burrows. From the early 1960s and for the next 40 years, David Wingate dedicated his life to helping the Cahow regain a solid foothold. He ran the conservation program for the birds, installing artificial nesting burrows. Today, there are 99 breeding pairs of Cahows. Fifty-three young hatched this year, and new breeding sites have been established. Although officially retired, Wingate is currently working on an improved artificial burrow, one that can be mass produced for use on yet another island where the Cahows may safely start a new generation. Today’s show brought to you by The Lufkin Family Foundation. Find more of the story on our website, birdnote.org. David Wingate, "The Bird Man of Bermuda"